Duhn-nuh duhn-nuh duhn-nuh duhn-nuh Hagman! Sometimes it seems like it’s only a matter of time before the hagfish comes up for discussion, though at least one person thinks that I may be, and I quote, “vastly over-estimating the market saturation of hagfish blogging.” Perhaps it’s a holdover from that one seminar talk I went to when I was in undergrad given by a professor who researched (among other things) the properties of hagfish slime. While he was talking my friend drew a quick sketch of Hagman, the hagfish superhero, and we all snickered loudly in the back row. Hagman then sporadically came up in conversation for weeks afterward, and still makes me snicker several years later. Hagman fights for truth, justice, and the Stanley Cup. There’s a good reason that hagfish are one of those creatures that gets a disproportionate amount of cultural presence, and that’s because they’re weird and gross. They’re marine invertebrates, living mostly at great depth in the ocean, burrowing into dead whale carcasses and other rotten corpses and eating their way out. They have no bones or jaws, but intimidating rings of scaly teeth. And when they’re attacked or startled, they produce a cloud of slime, tie themselves in a knot, shimmy out of the slime cloud that’s now engulfed the attacker, and escape. That’s an impressive trick, disgusting table manners or no. Hagfish slime is astounding. The mucus the hagfish produces is a milky white goo, and while it doesn’t produce much mucus at any one time, a small amount of mucus quickly turns a large container of water into a large mass of slime. Hagfish slime contains three things: seawater, slime threads, and mucins. Mucins are proteins found in mucus of all sorts, including saliva and gastric juices, while slime threads are thin protein tendrils that are curled up when excreted by the hagfish and then unfold when in seawater. Both mucins and slime threads are produced by separate glands located all along the body of the hagfish. Given how thick and, er, slimy hagfish slime is, intuition would say that either the slime is made up principally (or at least significantly) of either threads or the mucins, but it seems that this is not the case. It appears that hagfish slime is about 99.996% seawater, 0.0015% slime threads, and 0.002% mucins. So, given that hagfish slime is so cohesive, those threads and mucins must be pretty remarkable. The threads, when produced, are tightly curled or folded up, and unfold in water; mucin is produced in packets that swell with water, but do not burst. Mucin plays a critical role in the unfolding — threads will not form unless mucins are present in the solution. It’s thought that the mucin packets bind to the the threads somehow, almost like deep conditioner binds to hair, and in doing so make the thread unfold rapidly, but it’s unclear how exactly that works. 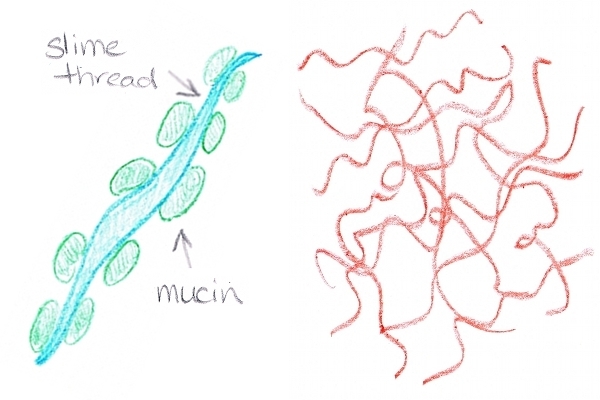 But given proportion of the threads to mucins, the size of the threads (~15 cm long unstretched, ~3 um thick in the middle), and the mucin packets (~7um long, ~3um thick), there is enough room on the threads for the mucin packets to bind to and give good coverage. Left: The slime thread tapers to the ends, and the ellipsoid mucins bond along its length. Right: The threads curl and tangle around each other, forming a network that traps water. The threads, when unfolded and covered in water-swollen mucin packets, then form a network throughout the slime mass. The threads are long, and can span the entire slime mass (depending on how much slime the hagfish is producing, ie, how agitated the hagfish is). This means that the threads, which while thin and diffuse, are quite strong, form a mass of channels and chambers in the slime mass. The seawater gets trapped in these channels and chambers, and cannot flow freely anymore. It doesn’t form a chemical gel, that is, the water does not stop flowing, but it slows down sufficiently to form a coherent, slimy mass. But how does the slime help them evade predators? Sure, it’s startling to suddenly have a mass of slime in your face, but is that enough of a deterrent to justify the energy costs to the hagfish? Slime may not only be startling, but it appears to be thick enough (and cohesive enough) that it clogs the gills of predator fish, which not only startles the attacker, but may suffocate them. But hagfish also have a nostril, to be able to sniff out dead whale carcasses and other food, and slime can get stuck in it too. To clear it out, hagfish sneeze. Hagfish are the only known type of fish that sneeze, though sadly, “hagfish sneezing” does not turn up any relevant videos. Hagfish aren’t so horrible after all! This entry was posted in Biology, Oceans, Weird Science and tagged gross, hagfish, hagfish slime, invertebrates, knot, slime, sneezing fish. Bookmark the permalink. I will now think of hagfish slime whenever I wash my hair. 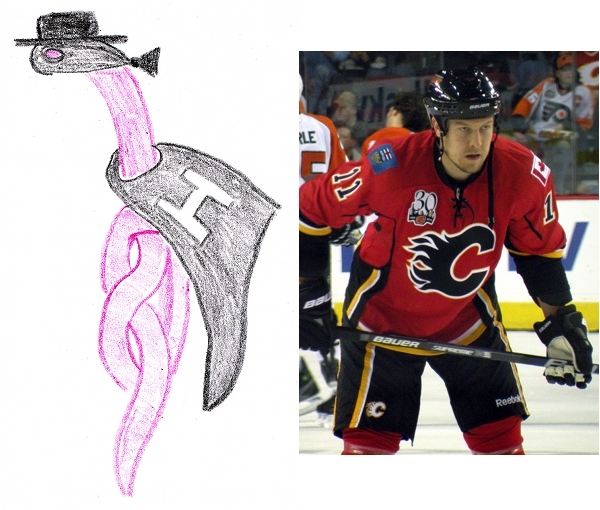 And if hagfish played hockey, I might actually watch it! Lampreys, as far as I can tell, have few redeeming features. As amusing as it would be to focus the blog on parasitic and scavenger invertebrates, I fear the audience for such a thing would be narrow (and also my knowledge of invertebrates is not that deep).